Are you ready to get started on your online journey to a graduate degree or certificate from WPI? Our dedicated team is available to help you through every step of the admissions process. Our flexible programs allow students with a technical baccalaureate degree to take up to two WPI courses before formal admission into a master’s program. Credits from these courses may be transferred into a graduate program upon formal admission into that program. To register, click here. Once submitted, a WPI representative will be within touch in 48 hours. While WPI allows students to take two courses, we strongly encourage students to begin the application process right away. Admittance to a course does not guarantee or equal admittance to a program. International students may take online courses from their home country, however online degree programs are not eligible for student visa status. For students who feel that they need to refresh some of their skills before applying, or who receive a conditional acceptance, our prep courses may help. 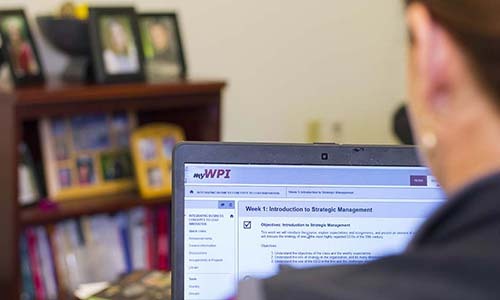 Entrance to a WPI online graduate program requires an equivalent bachelor’s degree and will likely require that this degree be ABET accredited (especially for engineering programs). Official transcripts are required for all online graduate programs. Other application documents vary by academic department and type of program (master’s, PhD, certificate). TOEFL or IELTS scores are required for international students who come from countries where English is not the first language. Scores must be sent to WPI (school code: 3969). To learn more about TOEFL and IELTS scores, visit the Graduate Catalog. Go to the Graduate Admissions Application and create your admissions account. You have your choice of which email address and password you prefer to use for the system. Once your account is created, you can log back in at any time to upload materials or check the status of your application. Once all materials are submitted, you will receive a confirmation email and your application will be sent for departmental review. The review process may take up to six to eight weeks and you will be notified via email when an admissions decision is reached. Letters of Recommendation Three letters of recommendation from individuals who can comment on your qualifications for pursuing graduate study are required. ** Please invite your recommenders to submit their letters electronically via the online application.